In the decade since it opened, Ruby Blues Winery has established a clearly-defined house style with wines that are easy to like. That seems to reflect the personalities of the winery’s owners, Prudence and Beat Mahrer. In an era when tasting room fees are routine, Ruby Tuesday only asks that its guests smile. If they are not smiling when they arrive, they are certain to be smiling by the time they leave. That is not to suggest that the wines at Ruby Blues are simple. Anything but. Blair is a detail-oriented winemaker. His wines have won major awards, including four Lieutenant Governor’s Awards in five years. He made friends with a family that had a winery in the Hunter Valley. He visited them during harvest and his wine interest was born. When he returned to Canada, a sister who was working in a wine shop suggested he should move to the Okanagan, work in a winery and take winemaking courses. He had a contact in Germany, Johannes Hasselbach from Gunderloch Winery. They had met when the German was working the 2006 harvest at Jackson-Triggs. Johannes referred him in 2010 to one of the leading wineries in Austria, Weingut Jurtschitsch. His experience on three continents has equipped him with what amounts to a graduate degree in hands-on winemaking. It shows in the consistent quality and predictable style of the wines at Ruby Blues. Ruby Blues Forever Young Chardonnay 2017 ($23). Forever Young comes from the lyrics of a song – but this is also a wine with a refreshing youthfulness. The wine was fermented in stainless steel, with 7% of it fermented in barrel for additional complexity. The aromas and flavours of peach and apple just dance on the palate. The fruity flavours persist on the finish. This is the first Chardonnay table wine at Ruby Blues. 91. Ruby Blues Pinot Gris Commune 2017 ($20). The term “Commune” means that grapes are from several vineyards. This expressive wine captures the vibrancy of Naramata Pinot Gris, with aromas of citrus and pear and flavours of pear and peach. The finish is crisp. 91. Ruby Blues Viognier Commune 2017 ($25). The winery is a master of Viognier, having won four Lieutenant Governor’s Awards with this variety. This is a rich and tropical wine, beginning with aromas of peach and apricot that are echoed on the palate. Bright acidity gives the wine appealing freshness on the finish. 92. Ruby Blues Gewürztraminer Commune 2017 ($20). The grapes for this wine are from 38-year-old vines and that accounts for the intensity of the aromas and flavours. The wine begins with floral and spicy aromas that lead to flavours of grapefruit and lychee. 91. Ruby Blues White Stiletto 2017 ($20). This is a blend of Pinot Gris, Pinot Blanc, Gewürztraminer, Riesling and Muscat. The wine is crisp and fresh, starting with aromas of citrus and spice. On the palate, there is a fruit bowl of flavours – melon, peach, green apple – with a touch of spice on the finish. 91. Ruby Blues Peace & Love & Bubbles NV ($25). This wine was judged the top Canadian sparkling wine in competition at this summer's All Canadian Wine Championships. This drinkable sparkling wine just cries out for a picnic in summer. The wine gets its pink hue from the Merlot in the blend. The other varieties in the blend are Pinot Blanc and Gewürztraminer. The wine is fresh and juicy, with aromas and flavours of raspberry and rhubarb. 90. Ruby Blues Pinot Noir Reserve 2016 ($50). This is the winery’s first Pinot Noir, made when two barrels in the cellar stood out for their richness and depth. The wine spent two months in new oak barrels and 14 months in older barrels. It has aromas of cherry mingled with toasty oak. It is silken in texture, with flavours of cherry and strawberry. 92. Ruby Blues Red Stiletto NV ($25). This is the winery’s signature red, made in an easy-drinking style and a blend of two vintages, with the younger vintage contributing fresh fruit flavours. It is a blend anchored with 35% Syrah, fleshed out with Merlot, Cabernet Sauvignon, Pinot Noir and Dunkelfelder. The wine begins with lovely aromas of cherry, vanilla and cloves, leading to spicy flavours of red berries. 90. Ruby Blues Black Stiletto 2016 ($35). This wine was first made in 2013 in response to customer demand for a more age-worthy wine than Red Stiletto. The blend here is 38% Syrah, 20% Merlot, 15% Cabernet Sauvignon, 12% Pinot Noir and 15% Dunkelfelder. The wine was aged 16 months in barrel and has a firm (but not hard) structure. It begins with aromas of black currant and cherry which are echoed on the palate. The finish is filled out with dark chocolate flavours. 92. Ruby Blues Late Harvest Chardonnay 2014 ($35 for 375 ml). This is a rare dessert wine from Ruby Blues. The grapes were picked under Icewine conditions but were allowed to warm a touch before the juice was pressed. The wine is plump with honeyed flavours of ripe mango and peach. Good acidity gives the wine a clean and fresh finish. 90. Victoria-born Cherie Spriggs is one of the best winemakers to have grown up in British Columbia – but she got away from us. She has just been named “Sparkling Winemaker of the Year” at the recent International Wine Challenge in London. The bad news is that you need an aeroplane ticket to taste her wines. She is the chief winemaker Nyetimber Vineyard, the pioneering West Sussex producer of sparkling wine in England, where she has worked for 11 years. She won four gold medals for sparkling wine at the IWC competition – along with an impressive list of awards over the years. The 16-hectare vineyard at Nyetimber was planted between 1988 and 1991 with Chardonnay, Pinot Meunier and Pinot Noir, the classic varietals for making Champagne. The winery was launched by Sandra and Stuart Moss, two Americans who believed that southern England had the soils and climate in which to grow wines rivalling Champagne. Their first release was a 1992 Première Cuvée, a blanc de blanc from Chardonnay. It won a gold medal at the 1997 International Wine & Spirits Competition. Once the Mosses had the winery on its feet, they sold it to the current owner and chief executive, Eric Heerema. He is the owner who hired Cherie Spriggs and her winemaker husband, Brad Greatrix. Cherie grew up in Langford on Vancouver Island. She was torn between science and classical music as a career, having studied piano. But an honours Bachelor of Science (in biochemistry) from Queen’s University in 2000 set the direction for her future. The University of British Columbia had just started its Wine Research Centre and was recruiting master’s students. Cherie and Brad both signed up in 2001. In 2004, they enrolled at the University of Adelaide for graduate diplomas in enology – degrees they completed in one year because of the strong science background both already had. At the time, Averill Creek did not have the budget for a full-time winemaker, let along a winemaking duo. So in February, 2007, Cherie and Brad applied at Nyetimber and were both hired (Brad, now the associate winemaker at Nyetimber, had worked the 2006 harvest at Chateau Margaux in Bordeaux). She and Brad had begun looking for winemaking opportunities in the Okanagan in 2007 when her husband suggested that they should apply for “dream jobs” even if they thought it unlikely they would get them. Cherie and Brad both sent their resumés to Nyetimber and, after two telephone interviews, were offered jobs. They have been at Nyetimber since early 2007. Cherie has been nominated twice before for the winemaker of the year award, finally breaking through this year. With almost 70 acres of vineyard and with contract growers, Volcanic Hills Estate Winery crafts an extensive portfolio of reasonably-priced wines. Now going into its 10th year, the winery is operated by Sarwan Gidda and his son, Bobby. Sarwan, born in India in 1953, was one of three brothers who launched Mt. Boucherie Estate Winery in 2000. Sarwan left that partnership in 2008 and built the 1,400 square-meter (15,000 square-foot) Volcanic Hills winery. A subsequent falling out between the remaining brothers led Mt. Boucherie into receivership and to new ownership several years ago. But it remains business as usual with Volcanic Hills. The winery is managed by Bobby. Born in 1985, he graduated in business administration at Okanagan College and worked in the finance department there while taking the college’s winery assistant and winery sales courses. As part of the course work, Bobby, who previously worked in the Mt. Boucherie cellar, designed Volcanic Hills, a $2.3 million winery with geothermal heating and cooling. The expansive wine shop is above the processing cellars, with a view of Okanagan Lake. Volcanic Hills, which opened in 2009, also has a popular restaurant next to the wine shop. The winemaker here is Daniel Bontorin, a veteran Okanagan winemaker. Born in Surrey in 1976, Daniel pursued various jobs in the Okanagan, including importing motorcycle parts, until 2000 when he recognized that the real future was in wine. After courses at Okanagan University College, he worked in the cellars at several wineries including Fairview Cellars, Domaine Combret, Hillside and Hester Creek. Then, after a vintage in northern Italy, he joined Le Vieux Pin in 2005 and became a consultant in 2010. The Volcanic Hills vineyards afford the opportunity to make a number of quite complex blends. The winery takes its name from its proximity to Mt. Boucherie, believed to be an extinct volcano. The terminology around volcanoes has inspired several of the winery’s labels. Volcanic Hills Bubbly Gewürztraminer 2016 ($19.79 for 243 cases). It is rare to see a sparkling wine made with this grape, if only because the variety loses acidity as it ripens. The grapes for this wine must have been picked early because there is enough acidity to give the wine a crisp, dry finish. It begins with a fruity aroma that leads to flavours of green apple, kiwi and spice. 91. Volcanic Hills Lava White Blend 2016 ($19.79 for 514 cases). This is a blend of 40% Pinot Gris, 20% Viognier, 18% Gewürztraminer, 10% Chardonnay, 7% Ehrenfelser and 5% Riesling Icewine. The wine has honeyed aromas and flavours of pear, mango and apple. The Icewine in the blend gives it 22 grams of residual sugar. The intensity of the Icewine makes the finish seem overly sweet. 88. Volcanic Hills Viognier 2016 ($21.69 for 515 cases). The winery says this wine is “very pretty and very tasty.” I could not be more in agreement. It starts with a dramatic aroma of ripe apricot, leading to rich, luscious flavours of apricot and guava. 93. Volcanic Hills Magma White 2016 ($15.90 for 515 cases). This wine is a blend of 48% Pinot Gris, 23% Viognier, 21% Gewürztraminer and 8% Ehrenfelser. The wine begins with herbal and spicy aromas that lead to flavours of pear, ripe apple and guava. There is a touch of residual sweetness but it is well balanced so that the finish seems dry. 90. Volcanic Hills Gamay Noir 2016 ($16.90 for 578 cases). This wine, made from mature estate vines, was aged five months in oak. It is a full-bodied wine with aromas and flavours of cherry that linger on the finish. 90. Volcanic Hills Pinot Noir 2015 ($19.99 for 375 cases). The wine was aged 13 months in French oak (30% new). This wine has the hallmarks of a hot vintage: the aromas and the flavours are ripe cherry mingled with oak while the finish is a bit rustic. 87. Volcanic Hills Lava Red 2015 ($19.79 for 1,207 cases). This is a blend of 58% Zweigelt, 21.5% Merlot, 11.5% Maréchal Foch, 3% Gamay, 3% Cabernet Sauvignon and 1.5% each of Cabernet Franc and Pinot Noir. Each varietal was fermented separately and barrel-aged 15 months in American and French oak. Just before bottling, a modest quantity of Zweigelt Icewine was added. It has aromas and flavours of cherries, blackberries and plum. The Icewine gives it an off-dry finish. It is not a style I care for but, given the volume produced, the winery has a strong following for off-dry red wine. 88. Volcanic Hills Magma Red 2015 ($17.39 for 1,100 cases). The blend is 53.7% Zweigelt, 27.3% Merlot, 10.7% Maréchal Foch, 2.8% Cabernet Sauvignon, 2.8% Gamay Noir, 1.4% Cabernet Franc and 1.4% Pinot Noir. The wine was barrel-aged 13 months in French and American oak (25% new). The wine is bold and juicy, with aromas and flavours of spicy dark cherry and plum. 91. Volcanic Hills Syrah 2014 ($26 for 798 cases). The grapes for this wine are from Osoyoos. There is 5% Cabernet Sauvignon in the blend. The wine was aged 14 months in French and American oak. It is a bold and dark wine with classic aromas and flavours of deli meat, spiced plum, fig and black pepper. 92. Volcanic Hills Cabernet Franc 2014 ($21.99 for 378 cases). Grapes for this wine were sourced in Oliver. The blend is 87% Cabernet Franc and 13% Merlot. The wine was barrel-aged 15 months in French oak (40% new). The wine shows the typical brambly aromas and flavours of a variety whose profile is on the rise. Decanting is recommended. 90. Volcanic Hills Cabernet Sauvignon 2014 ($27.49 for 645 cases). Grapes for this wine were sourced from growers in the Similkameen Valley and from Oliver. The wine was aged 18 months in French and American oak. The wine begins with aromas of black currant and black cherry. Those are echoed on the concentrated palate, along with flavours of tobacco and dark chocolate. 91. Volcanic Hills Eruption 2014 ($27.49 for 434 cases). This is a blend of 75% Merlot, 15% Cabernet Sauvignon and 10% Cabernet Franc. The grapes are sourced in both the Similkameen and the south Okanagan. The wine was aged 15 to 18 months in French oak. The wine begins with aromas of black currant. The palate is quite concentrated (decanting is recommended), with flavours of black currant, black cherry, dark chocolate and dark coffee. 90-92. Rocky Creek Winery recently announced a milestone: its wines have won 100 medals since this Cowichan Valley winery opened 13 years ago. That achievement was all the more satisfying because of what co-proprietor and winemaker Mark Holford had been through in recent years. For background on the winery, here is an excerpt from John Schreiner’s Coastal Wine Tour Guide. Born in Deep River, Ontario, in 1968, Mark is a chemical engineer with a master’s degree in environmental engineering. He met Linda in Calgary, her hometown, when he was completing a co-operative studies assignment with an oil company. She is an engineering technologist with management skills gained in the oil industry. They spent two and a half years in Sarnia where Mark worked in the Shell petrochemical plant. “But we always wanted to come to Vancouver Island,” says Linda. “When we were in Calgary, we wanted to get a job [here] and an opportunity happened first in Sarnia.” In the fall of 2001 Mark and Linda were vacationing in Victoria, where Linda’s retired parents lived, when he found a position at the pulp mill at Crofton. They bought a home nearby in Ladysmith. Plans for a winery were put on hold because there was no room for a vineyard on their suburban street. Then they discovered they could get a commercial license and make wine with purchased grapes. Rocky Creek opened in 2005, making 600 cases with grapes from a vineyard at Chemainus and with purchased wild blackberries. Their first release was a port-style blackberry wine – which also won the winery its first medal. Linda and Mark … figured out that small wineries are more profitable with a land-based license (because government takes much less in taxes and charges). In the winter of 2008 they moved to a three-hectare (7½-acre) farm in the Cowichan Valley, on a property almost back to back with Venturi-Schulze Vineyards. Here are notes on current releases from Rocky Creek. Rocky Creek Pinot Gris 2017 ($20 for 550 cases). The delicate pink hue of this wine is the result of 16 hours on the skins. The wine has aromas and flavours of grapefruit and apple. The finish is crisp and refreshing. 90. Rocky Creek TLC 2017 ($22 for 350 cases). This is a blend of Madeleine Sylvaner, Viognier, Albariño, Siegerrebe and Ortega. The wine begins with floral aromas. On the palate, the flavours mingle tropical fruits with a medley of herbs. The texture is luscious. 90. Rocky Creek Robin’s Rosé 2017 ($22 for 180 cases). Made with Pinot Noir, this wine has a vibrant, inviting pink hue. It begins with aromas of cherries, echoed on the palate along with wild strawberry notes. It is tangy and crisp on the finish. 88. Rocky Creek Pinot Noir 2015 ($25 for 200 cases). The wine begins with aromas of spice and smoke, leading to flavours of cherry and red currant. 87. Rocky Creek On the Mark NV ($22 for 300 cases). This is a six-grape blend: Cabernet Foch, Pinot Noir, Maréchal Foch, Tempranillo, Malbec and Carménère. The nose recalls an oak-aged Rioja, with notes of oak, fig, plum and cherry that are echoed on the palate. 90. Rocky Creek Wild Blackberry NV ($25 for 800 cases of 500 ml bottles). This port-style dessert wine (16% alcohol) is a Vancouver Island tradition. The aromas and flavours of fresh blackberries are intense. A dash of sparkling soda would turn this into a refreshing summertime drink. 89. It is one of several neighbouring vineyards in the Similkameen that are producing exceptional ripe and full-flavoured grapes from their sun-drenched rocky slopes. None are quite as ruggedly rocky as Vanessa but all benefit from intense sunlight. With its current releases, Vanessa compares the heat units at its property with the south Okanagan. In 2014, Vanessa had 1,920 growing degree days compared with 1,702 at Osoyoos. In 2015, an even warmer year, Vanessa had 2,049 growing degree days compared with 1,764 at Osoyoos. Those two years bordered on the extreme for heat. The heat units at Vanessa in 2016 and 2017 were 1,757 growing degree days, more than enough to ripen fruit. The Viognier grapes were picked at 30 brix, yielding a wine with 14.9% alcohol. There is no doubt that Vanessa – and much of the Similkameen - can produce wines that are powerful and intense. Vanessa is a 75-acre vineyard planted in 2006 on a 220-acre property. Owners Suki Sekhon and John Welson had the first vintage produced for their winery in 2012. Vanessa Vineyards remains a small-lot producer, selling most of its grapes to Andrew Peller Ltd. The Vanessa wines on the market have been made at the Peller-owned Red Rooster Winery by Karen Gillis, the winemaker there. The Vanessa profile is rising. Last year, Vanessa opened a tasting room at its vineyard. Currently, that is the only retail outlet for the wines, other than the Vanessa wine club and a selection of premium restaurants. Also, Howard Soon became Vanessa’s winemaster last year after retiring from a long and distinguished career at Calona Vineyards and its sister winery, Sandhill Wines. Here are notes on current releases from Vanessa. Vanessa Viognier 2017 ($24.99 for 200 cases). This is a ripe and luscious wine, the result leaving the grapes on the vines to mid-October for maximum flavour development. Apricot and peach aromas jump for the glass and lead to flavours of ripe apricot and guava. Good acidity keeps the flavours fresh. The finish goes on and on. 93. Vanessa Rosé 2017 ($24.99 for 200 cases). This is a blend of 67% Merlot and 33% Syrah. Limited skin contact captured a delicate and appealing hue. The wine has aromas of cherry and raspberry leading to flavours of strawberry and watermelon. It is balanced to finish cry and crisp. 91. Vanessa Cabernet Franc 2015 ($49.99 for 220 cases). This wine was fermented and aged 20 months in French oak (30% new). The brambly blackberry aromas mingle with nots of coffee, cherry and toasty oak. Dark fruit flavours of figs and dates framed by vanilla and spice coast the palate. 93. Vanessa Cabernet Sauvignon 2015 ($NA for 195 cases). This wine is scheduled to be released in September. Decanting is recommended to allow the rich texture to emerge. The wine begins with classic mint and black currant aromas. On the palate, there are flavours of black currant and blackberry with coffee and dark chocolate on the finish. 92-94. Vanessa Syrah 2014 ($N/A for 425 cases). The Syrah was co-fermented with 10% Viognier. The wine was aged for 20 months in new and second-use American and French oak barrels. Svelte in texture, the wine begins with aromas of plum and fig. On the rich palate, there are flavours of black cherry mingled with deli meats and spices, along with a touch of black pepper. 92. Vanessa Meritage 2014 ($N/A for 775 cases). This is 37% Cabernet Franc, 35% Cabernet Sauvignon and 28% Merlot. Each varietal was fermented on its own and aged eight months in barrel. After the final blend was assembled, it aged another 12 months in American and French oak, of which 40% was new. It is dark in colour and bold in flavour. It begins with aromas of vanilla, black cherry and richly spiced dark berries, all of which is echoed on the palate. The finish is generous and long-lasting. 94. The Osoyoos Indian Band, the 51% owner of Nk’Mip Cellars, had a stroke of good luck two decades ago when they applied for a casino license. They regrouped to build North America’s first aboriginal-owned winery (in partnership with Vincor, now known as Arterra). Nk’Mip Cellars, now making nearly 20,000 cases a year, is undoubtedly one of the top wineries in the Okanagan. Throngs of visitors, none of them apparently interested in laundering money, crowd the elegant wine shop all season. The winery is a solid business success, a source of pride and employment for the 500-member band. Under the mentorship of senior winemaker Randy Picton, Justin Hall, a member of the band, has become a winemaker and, in 2017, took over responsibility for the white wine portfolio. Aaron Crey, a member of a Fraser Valley band, is the cellar supervisor. This team has worked together for a long time. There is no sign that either the Band or Arterra want to unwind of the most successful partnerships in the Okanagan wine industry. The relationship dates from about 1980 when T.G. Bright & Co. leased land north of Oliver and built a winery. The production of alcoholic beverages on Indigenous land was contentious at the time. That modest 1980 winery, a great commercial success, now is a sprawling production facility for five or six million cases annually. Numerous band members have had successful careers there. The relationship expanded in the early 1990s when Vincor, as the company was then called, leased about 1,000 acres of raw land from the band for the vineyards that now supply the Arterra wineries, including Nk’Mip. Nk’Mip Cellars opened in 2002. The winery has since anchored the development of a resort with condominiums, a golf course and an exceptional cultural interpretation centre. The initial Nk’Mip vintages (2000 and 2001) were made by Bruce Nicholson, then the winemaker at the Jackson-Triggs winery in the big Oliver complex. 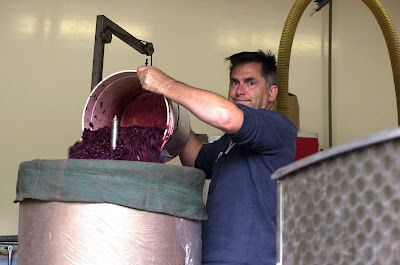 Randy was recruited in 2002 from CedarCreek Estate Winery. He enrolled in the inaugural winery assistant program at Okanagan University College in 1995. “At the time what I knew about wine was that it was either white or red,” he said. He worked the 1995 vintage with CedarCreek and that led to a job in the cellar. Within five years, he was the associate winemaker. On several occasions, he filled in as interim winemaker during staff changes. He had solid hands-on experience when Nk’Mip hired him. The winery that he joined 16 years ago now is running at capacity. While consideration has been given to expanding the production capacity, Nk’Mip instead has been elevating its portfolio. More of its wines now are released in the premium-priced Qwam Qwmt tier (Salish for achieving excellence). The winery can do that because it has access to premium-quality grapes. Nk’Mip Winemaker’s Series Pinot Blanc 2017 ($17.99). The wine begins with aromas of green apples and citrus, leading to flavours of flavours of apple and peach. The finish is crisp. 91. Nk’Mip Winemaker’s Series Chardonnay 2016 ($18.99). Lightly oaked, this is a refreshing wine with aromas of citrus and flavours of cloves and ripe pineapple. 91. Nk’Mip Winemaker’s Series Dreamcatcher 2017 ($17.99). This is a blend of 60% Riesling and 20% each of Sauvignon Blanc and Ehrenfelser. The wine is fresh and lively, beginning with aromas of citrus leading to flavours of citrus, peach and pineapple. The racy acidity, well balanced with residual sugar, gives the wine great lift on the palate. 91. Nk’Mip Winemaker’s Series Rosé 2017 ($17.99). This is a saignée of Merlot, Pinot Noir and other red varietals. It has aromas of cherry and rhubarb, leading to flavours of strawberry and cherry. The finish is dry. 90. Nk’Mip Winemaker’s Series Pinot Noir 2015 ($23.99). This full-bodied Pinot Noir begins with aromas of cherry and spice, leading to flavours of cherry and cola. The texture is silky. 90. Nk’Mip Winemaker’s Series Merlot 2015 ($21.99). The wine begins with aromas of plum, black cherry and blueberry. The palate is plump, with flavours of cassis, black cherry and plum. 90. Nk’Mip Winemaker’s Series Talon 2015 ($23.99). This blend is 30% Syrah, 22% Merlot, 21% Malbec, 15% Cabernet Sauvignon, 11% Cabernet Franc and 1% Pinot Noir. The wines were fermented separately, aging 18 months in French and American oak before being blended. The wine has aromas and flavours of plum, fig and black currant. 90. Nk’Mip Qwam Qwmt Chardonnay 2016 ($24.99). This wine has already won a gold medal at the Chardonnay Du Monde competition. The oak is very subtle (“I don’t want to smell oak,” Randy says), with bright fruit aromas and flavours front and centre. The wine has flavours of pineapple, apple and citrus with a delicate hint of clove on the finish. 92. Nk’Mip Qwam Qwmt Riesling 2016 ($23.99). This dry, age-worthy Riesling begins with aromas of lime with hints of petrol and wet stone. The concentrated flavours are a medley of nectarine, lemon and peach. 92. Nk’Mip Qwam Qwmt Pinot Noir 2016 ($32.99). The wine was aged for 10 months in French oak (30% new). The perfumed aroma displays strawberry, raspberry and spice. On the palate there are flavours of cherry and raspberry with lightly toasted oak on the finish. Silky tannins define the polished texture. 93. Nk’Mip Qwam Qwmt Merlot 2015 ($25.99). This plush, mouth-filling Merlot has aromas and flavours of plum, black cherry, black currant and chocolate. 91. Nk’Mip Qwam Qwmt Cabernet Sauvignon 2015 ($Sold out). Because of the east/west orientation of the rows, the two sides of the vine are picked at different time to assure peak flavour and ripeness of all the fruit. In this vintage, the sun-bathed south side of the rows was picked October 13, while the north side was picked October 16. The two lots were fermented separately and aged 18 months in barrel before final blending. This wine begins with aromas and flavours of mint and black currant. The long, ripe tannins will give this wine some longevity in the cellar. 92. Nk’Mip Qwam Qwmt Cabernet Sauvignon 2016 ($N/A). This elegant and complex wine definitely should be cellared; it likely will peak in 2026. The aromas of cassis and black cherry lead to flavours of dark fruits mingled with tobacco and chocolate. 94. Nk’Mip Qwam Qwmt Syrah 2015 ($32.99). This is a bold, ripe expression of a hot vintage. It begins with aromas of black pepper and black cherry, leading to a medley of sweet berry flavours, with undertones of dark chocolate. 92. Nk’Mip White Mer’r’iym 2016 ($29.99). This is a new wine in the portfolio, to complement the winery’s flagship red. This is a blend of 70% Sauvignon Blanc (fermented in stainless steel) and 30% Sémillon (fermented in new French oak). The wine begins with aromas of lime and herbs. On the palate, the tropical fruit flavours are led by lime with a subtle hint of oak. The finish is crisp and zesty. 91. Nk’Mip Mer’r’iym 2015 ($54.99). This is a blend of 57% Cabernet Sauvignon, 21% Malbec, 16% Merlot and 6% Cabernet Franc. The wine was aged 18 months in barrel, mostly French. The wine begins with aromas of cassis, blackberry, mint and cedar. The rich, dark fruits on the palate include flavours of black currant, black cherry and chocolate. 95.